A true story about love and loyalties in families and family businesses the world over; risk, luck, laughter, hard work – and what happens when the little guys take on the big guys. It is life – affirming, optimistic and uplifting; and it really did happen. It is also Very Funny Indeed. Doesn’t matter if you know nothing or everything about radio and broadcasting; doesn’t matter where you are in the English – speaking world. This hilarious but touching true story is sure to engage and entertain any adult reader born with a sense of humour. 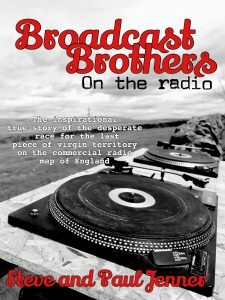 Towards the end of the last century in Britain, there was a modern – day gold rush; the rush to establish independent commercial radio stations in ‘virgin territories’ – or ‘white space’ – throughout the country. Like Canal Mania and Railway Mania before it, the competition was cut – throat, the race headlong, the consequences unforgiving for the losers, life – changing for the winners. And the name of the game was Frequency Mania – the frantic scramble for control of the scarce FM radio frequencies which determined the rights to provide commercial radio services in regions right the way across the country. This is the story of two brothers who grew up in the former Nottinghamshire coalfield, whose efforts would define this desperate dash. Without the benefits of money, status or influence, they took on the power of an indifferent Establishment in pursuit of their dreams and in doing so, changed the broadcasting map of the country forever. From toddlers to pirate radio DJs, from rank outsiders to the very heart of the broadcasting business, this is a white – knuckle ride through the country’s opportunities and limitations, told with urgency and a finely – tuned sense of the ridiculous. With a nod to Danny Baker’s ‘Going To Sea In A Sieve’, this land – based version of ‘The Boat That Rocked’ thirty years after is an affectionate and hilarious ‘Spinal Tap’ for UK radio. Steve and Paul Jenner are professional broadcasters, authors and businessmen. They have clocked up over 30000 on – air hours between them on a wide variety of commercial and BBC radio stations and are two of the most recognisable radio voices in the Midlands and North West. Steve has experience as a press officer, music journalist and media commentator and has also been a teacher, property developer and Roversport – sponsored racing driver in national championships. Paul is a licenced F.A. coach and director of a football club, and is well known as being an accomplished auctioneer for local charitable causes. Both have business interests beyond radio. Steve first took tentative steps to becoming a DJ in 1972, putting together a rig which was ‘borderline lethal’ and performing his first gigs soon afterwards. He’s been taking money off of people for playing records to them ever since. After a spectacularly pathetic failed attempt to break into hospital radio, he got into the broadcasting business through the ‘back door’, having been introduced to Nottingham pirate station Horizon Radio by Paul in the early 90’s. This led, extremely indirectly to a unlikely career as a professional broadcaster, during which he would present all the major on – air shifts on commercial radio; weekday breakfast, the sports show, drivetime, the weekday afternoon show, and a number of high – profile presentation slots such as in – studio ‘anchor’ presenter on Ashbourne Radio’s Shrovetide Football coverage which he continues to do to this day, and along with Paul was one of the three – presenter on – air team at High Peak Radio for Live Aid 2, for which the station received a commendation from Sony. He was also Managing Director of both stations for a spell. His career as a professional broadcaster really took off when he became press and media officer for the national language pressure group Plain English Campaign, and could be seen fighting to defend the apostrophe, amongst other things, as a ‘talking head’ on most the major TV networks including the BBC (He’s been on the famous breakfast Red Sofa on five occasions, both in London and later in Salford), ITV, Sky News and CNN as well as a wide range of international TV networks including South Korean and Russian national TV networks and has been a guest on virtually every BBC local radio station in the country including national stations such as Radio 2, 4 and 5 Live as well as BBC Scotland, Wales and in Northern Ireland and national commercial services such as Talk Radio. He cheerfully admits such heady days are behind him now but he’s still part of the presentation team on both High Peak Radio and Ashbourne Radio and enjoys ‘the odd run out’ presenting on – air auctions, ‘double – heading’ with his brother and has concentrated in recent times on his work as an author, as well as floating gently through the countryside on his narrow boat ‘whenever the chance presents itself’. As one of the two founding directors of both radio stations, his main role now is to stay in touch with the licencing authority, OFCOM. As such he led the successful expansion of Ashbourne Radio into both Wirksworth and the wider Derbyshire Dales and Uttoxeter and the Staffordshire borders. Paul played his first record to a paying audience in 1974 and the numbers of people who have seen him ‘live’ since then, topped a million some time ago. After many years running his nationally – touring disco roadshow, he was introduced to pirate radio by former High Peak Radio breakfast presenter Barry Jarvis – and he’s never looked back! The commercial ‘engine’ behind the Broadcast Brothers, Paul was once described by a Sony – award winning broadcaster as a ‘Pocket Hercules!’ and there is absolutely no doubt that without Paul’s sales and marketing skills, The Broadcast Brothers would just be The Brothers. Having spent years kicking lumps out of people on the football pitch, he too has seen something of a ‘poacher turned gamekeeper’ turnaround with his appointment as a licenced F.A. coach and football club directorship. As well as being one of the founding directors of High Peak Radio, he is currently Managing Director of both stations, so doesn’t have as much time to ‘mess around’ as his older brother! As an auctioneer at charity events and the main in – studio force behind the legendary on – air auctions, Paul has helped raise hundreds of thousands of pounds for good causes. Along with his brother he has always ensured there is a free – to -access community strand to the on – air output; which is not always the case with commercial radio stations.